I know how to ride a bike. I don’t mean to brag, but really, I know how to ride a bike. Although I’ve known how to ride a bike for years, I barely remember how my parents taught me how to ride. The only bit I remember is jumping on my new no-training-wheel bike and riding away from the store with my mother holding on to the back keeping me upright, and then finding out that my mother had let go at some point. So, I remember that first moment of riding without training wheels or an adult’s assistance, but I don’t remember the work (if any) that came before and after that point. This doesn’t matter much for my bike-riding anymore, of course, but now D’s trying to figure out how to ride a bike without training wheels. And I don’t really know what to tell him. I know how to do it myself, but I don’t always know how to help my child learn. I know I’m not alone in this. My wife tells stories about the difficulty her father had in teaching her how to drive a stick shift; of course, it was easy for him after all those years, so how could it not be easy for her? They had the same problem when he had no idea how to help her swallow a pill. Do I need that step-by-step technique to be able to solve 32 minus 12? No, of course not – I can do it in my head. Even though this problem is a simple scenario for the familiar approach, that doesn’t mean the new technique is useless, because we’re not really using the old approach (carry the ones, etc.) when we do that simple problem in our heads – we have enough experience that we can skip algorithms for the simple case. But how about the worst case for the old approach, something like 1001 minus 2? Again, that’s a problem we can do in our heads, but this video from Christopher Danielson shows that rigorously following the old approach is a slog of subtracting each column and carrying the ones over, etc. In this case, the “new” approach is actually much simpler. In real life, some subtractions are trivial (like 15 minus 3) and some take a bit more time (like 233 minus 187). I know that when I hit the second type, I do something like “233 is 33 more than 200, and 187 is 13 less than 200, so the answer is 33 plus 13, or 46,” which is exactly what the new approach teaches. So, even though I might use an approach like this one for hard problems, I don’t need a step-by-step technique for subtracting small numbers. But that’s because I’m an adult who has been doing this sort of easy subtraction for three decades; it’s nearly second nature to me now. Just like riding a bike is. However, just as I need to figure out how to help D learn how to ride his new bike, children who don’t have years of experience with subtraction need to be taught how to do it. I’m really disheartened by how many people are flipping out about these new approaches to teaching children useful skills. I get a real sense that some of these commenters don’t have the empathy to remember that children need to learn things for the first time. That they forget that just because something comes easy to them now doesn’t mean that it wasn’t ever hard. That they think it’s ridiculous to practice a powerful technique on easy problems before taking advantage of its power on harder problems. That they prioritize not having to learning anything new as adults over helping their kids learn in a better way. But we have to remember that the explanations and shortcuts that work for us might not work for our tyro children. I feel a bit like a fool when I’m in the driveway telling D for the twentieth time how to start pedaling his bike, because I don’t know if he’s listening to me, or if knows what to do but is having trouble getting his body to do what he wants, or if my words sound like gibberish to him, or if I’m telling him the wrong thing to do. I know how I get my adult body with decades of muscle memory to start a bike, but I don’t know for sure what D needs to do to figure it out for himself. But I keep trying to remember what it’s like to need to learn something, and I keep encouraging him to try again. And I’m seeing him learn, even when it took teaching something that I wouldn’t need to be told myself. 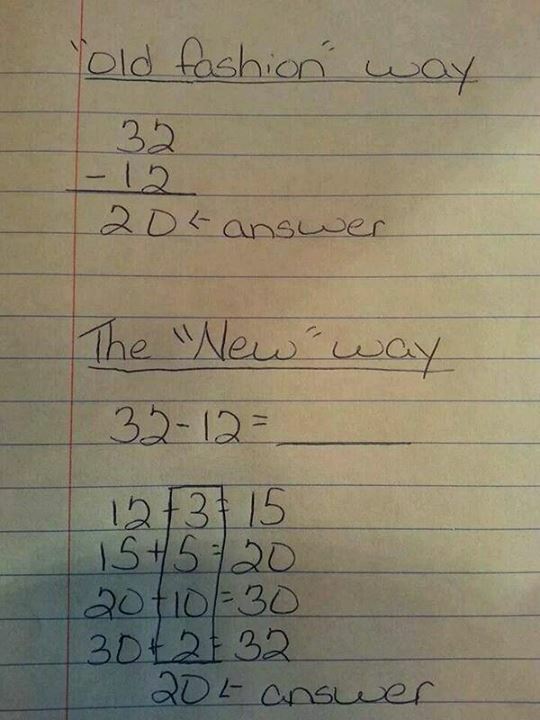 *BTW, using these math problems to attack Common Core shows political misdirection: Common Core includes both the new way and the old way along with other approaches that might be useful for children. I don’t know if you’re looking for advice about teaching to ride a bike, but after several frustrating “run behind holding the seat” lessons, what worked for my daughter was to _take the pedals off_ and turn her loose to push with her feet. Without the distraction of pedaling, she was able to work on her balance, and she never got going so fast as to have serious fall problems. When she felt confident and ready, we put the pedals back on, and she almost took off like a natural. We’ve tried that, but D really resisted using a pedalless bike. I think some of the problem is, there is too much emphasis on testing on a particular technique. You should, once you understand how subtraction works, use whichever is best for you. Then on top of forcing a certain technique for an overly contrived problem, you then need to write an explanation. So the student needs to not only “get it” but also then explain it back, which is sort of the point of this post. Once you know how to do it, that doesn’t mean you know how to teach it to someone else, and for a 5th grader, why is that necessary. So the protest isn’t on the fact that the various techniques are used, but, at least in New York, the extremely poor writing, poor choice of examples, and ambiguous questions that are in the common core materials that are provided. One can hope that this will get better, but again, teachers should have the flexibility to teach this. The goals of understanding why and how the process works are great, and ambitious, but the current materials leave much to be desired to actually achieve those goals.